The ‘Committee / Training Room’ is located off the lounge bar in The Belhouse and has just been the subject of a major refurbishment. 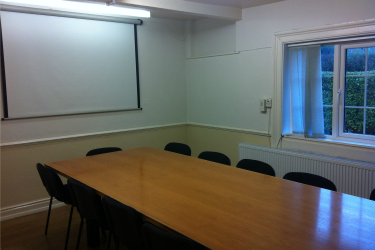 It is ideal meeting room for small groups and training sessions now boasting a projector, large screen and flip chart all with free WiFi access and can accommodate up to 12 delegates, seated around a board room style table. Refreshments may be provided if required, please enquire for details. It is also ideal for setting out a buffet for small functions taking place in the lounge bar ie. Christenings or Funerals. Buffets for Christenings and Funerals can be provided in house if required please enquire for details. If you would like to make a booking you will need to fill in a booking form and send or hand in at the office along with your payment. Please contact Pauline using the details above to request a form.